As we announced in the previous report, our 31th Scrum sprint was slightly shorter than the usual ones. But you would never say so looking to this blog post. We have a lot of things to talk you about! 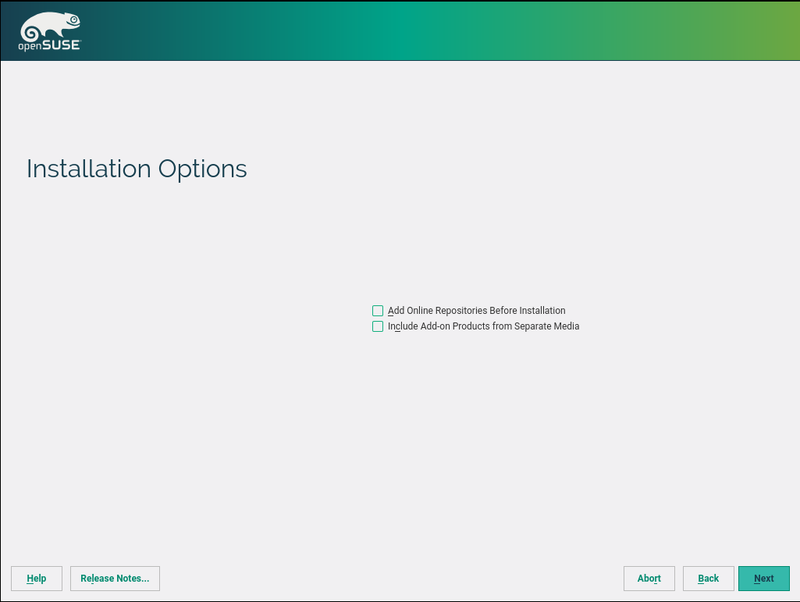 As you may know, YaST includes a nice feature which allows the installer to update itself in order to solve bugs in the installation media. 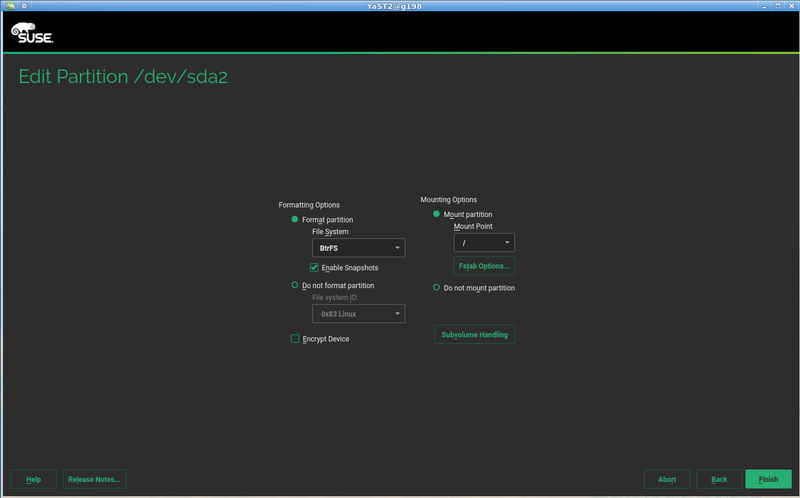 This mechanism has been included in SUSE Linux Enterprise 12 SP2, although it’s not enabled by default (you need to pass an extra option selfupdate=1 to make it work). So after getting some feedback, we’re working toward fixing some usability problems. The first of them is that, in some situations, the self-update mechanism is too intrusive. Consider the following scenario: you’re installing a system behind a firewall which prevents the machine to connect to the outside network. As the SUSE Customer Center will be unreachable, YaST complains about not being able to get the list of repositories for the self-update. And, after that, you get another complain because the fallback repository is not accessible. Two error messages and 2 timeouts. And the situation could be even worse if you don’t have access to a DNS server (add another error message). So after some discussion we’ve decided to show such errors only if the user has specified SMT or a custom self-update repository (which is also possible). In any other case, the error is logged and the self-update is skipped completely. 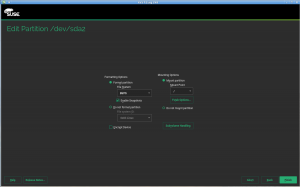 You can find further information in our Self-Update Use Cases and Error Handling document. During upcoming sprints, we’ll keep working on making the self-update feature great! While CaaSP release approaches, our team is still working hard to satisfy the new requirements. Thankfully, YaST is a pretty flexible tool and it allows us to change a lot of things. 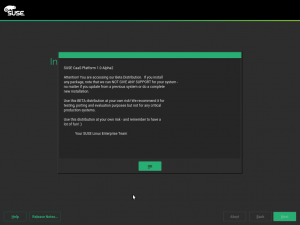 For CaaSP installation, YaST features a one-dialog installation screen. 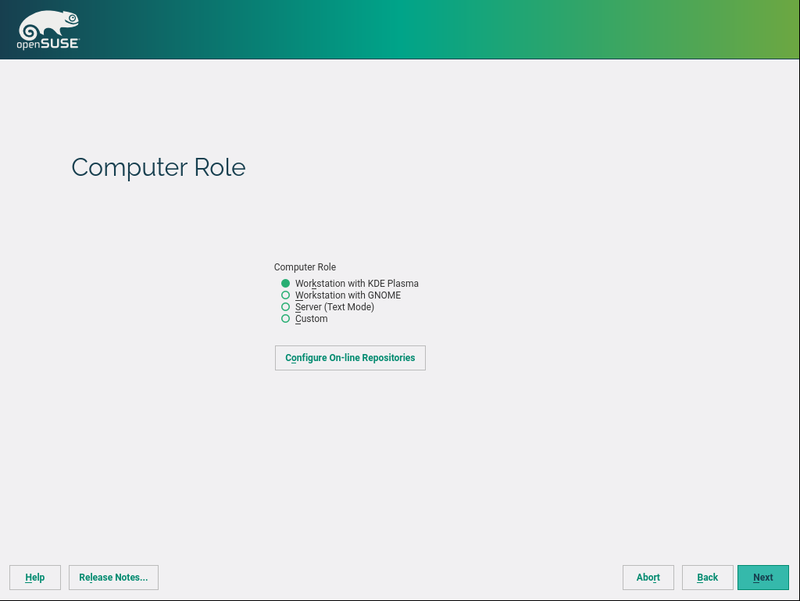 During this sprint, configuration of the Worker role has been implemented, including validation of the entered URL and writing the value to the installed system. You can check the animated screenshot for details. The world of Linux desktop environments change relatively quick, with new options popping-up and some projects being abandoned. Thanks to the openSUSE’s community of packagers we have a lot of these new desktop environments available on the openSUSE distributions. But the status of those packages for openSUSE is also subject to changes: some desktop environments are poorly maintained while others have a strong and active group of packagers and maintainer behind. 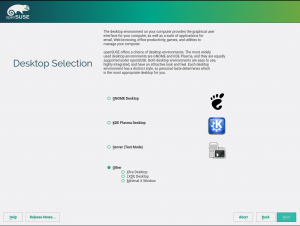 The YaST Team does not have enough overview and time to watch all these desktop environment and evaluate which one is ready or not for being in the installer’s desktop selection screen. So the openSUSE Release Team decided to replace this dialog with something a bit more generic but still useful for newcomers. 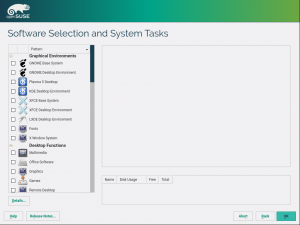 They asked the YaST Team to come up with a new dialog featuring the two openSUSE main desktops (KDE Plasma and GNOME) and allowing the easy selection of other environments without reworking the dialog in the future. The goal of that new dialog was to replace the existing one you can see in the following screenshot. We decided the new dialog should rely on patterns for several reasons. 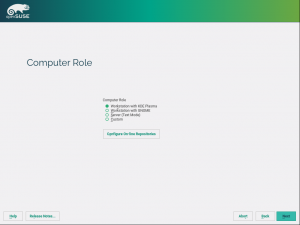 The main one is that the set of patterns is under the close control of the openSUSE community, which looks more closely than us to the desktop environments and their integration into the distribution. Moreover, each pattern specifies its own icon and description that can be somehow re-used by the installer. We also took the opportunity to merge this almost empty and outdated dialog with the new one. Addons are no longer produced for openSUSE, so only the second checkbox made any sense nowadays. 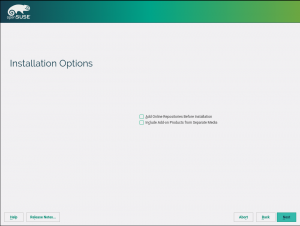 Moreover, the functionality of that second checkbox directly influence the available selection of patterns, so it made more sense to merge everything in a single screen that keeping an extra step in the installation just to accommodate a checkbox. So we sent a proposal for the new dialog to the opensuse-factory mailing list and, after implementing many of the ideas discussed there (like better wording or using a button instead of a checkbox for the online repositories), this is the new dialog that replaces the two ones mentioned above. Selecting “custom” will take the users to the already existing patterns selection screen. Just in case you don’t remember how that screen looks like, you can check this image. If these screenshots are not enough to make your mind about the change, you can check the following animation, in which KDE Plasma is initially chosen to be changed at a later point (going back in the workflow) to LXQt. It will take some time before the changes hit the Tumbleweed installer, since they obviously have a non-trivial impact on the openQA tests, that will need some adaptation. We would like to thank everybody that contributed to this new feature by providing feedback and suggestions through the mailing list. Once again, the openSUSE community has proved to be simply awesome! Our reimplementation of the storage layer keeps getting improvements here and there. With the base x86 case working, we are now implementing the tricky parts, like the partitions renumbering that takes place when dealing with logical partitions in a MBR style partition table. With GPT partition tables or with primary partitions in a MBR partition table, the partition gets a number (like sda1) when it’s created and keeps that number for its whole lifetime. But logical partition gets constantly renumbered when other partitions are created and destroyed. We need to know in advance what device name every partition will get in order to configure everything beforehand and only commit the changes to the disk when the user clicks in the “install” (during the installation process) or “commit” (if running the expert partitioner). Now, libstorage-ng is able to simulate in memory the re-numbering process, so we can calculate all the settings related to partitioning (like the configuration of the bootloader) before really touching the disk. The way kdump works is by allocating some extra memory at boot time and putting a second kernel+initrd there. When the main kernel realizes it is crashing, it transfers control (by kexec) to the other one, which has only one purpose, to dump the memory of the crashed kernel. In the upcoming Containers as a Service Platform, kdump was not working because the root filesystem is read-only there and we were not able to create the kdump initrd. We fixed it by creating it just after the RPMs are installed, when the FS is still read-write. Kdump was not the only component affected by the fact of having a read-only filesystem in CaaSP. Snapper was also running into problems when trying to execute the rollback and cleanup operations. Now the problems are fixed. While working on that we did enough interesting findings to deserve a separate blog entry. So you can expect a new entry in the Snapper.io blog soon. While we work on the new storage system, we are still taking care and improving the current one that will continue to be shipped with SLE12-SP3, SUSE CaaSP and openSUSE Leap 42.3. During this sprint we introduced a couple of usability improvements in the expert partitioner related to Btrfs subvolumes. First of all, we moved the “Enable Snapshots” checkbox that was pretty much hidden in the “Subvolume Handling” dialog to the place where it really belongs – below the selector of the file-system type. In addition, we added the warning you can see in the screenshot below for users enabling snapshots in a potentially problematic setup. And talking about warnings, we improved the CaaSP installation dialog to show the Alpha/Beta product warning at the beginning. 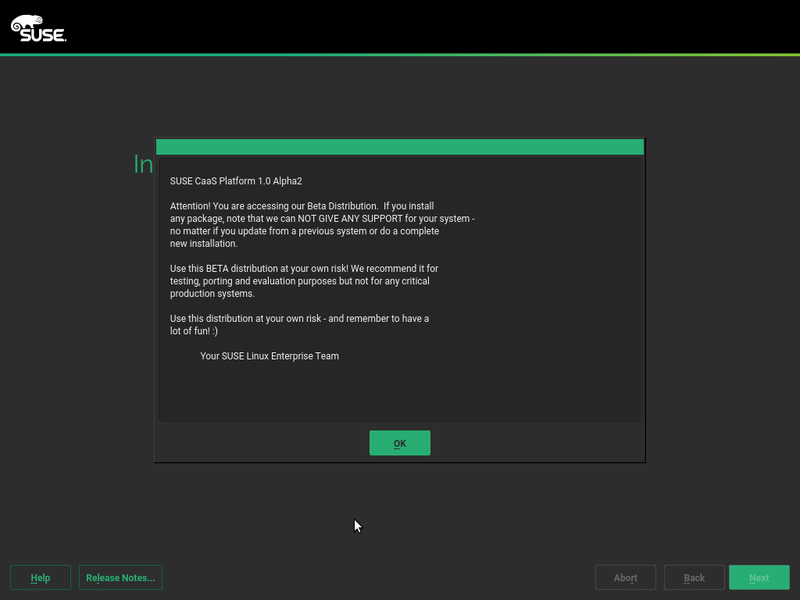 After changing the CaaSP installation to use the all-in-one dialog described in our previous post, this feature was lost as it is part of the initial EULA dialog. Now it is back and the users should now properly see the current product status. Back to our storage layer reimplementation, the new system is now able to propose a setup with encrypted LVM. Since some sprints ago, we were already able to propose a partition-based and a LVM setup. That means the new proposal is now feature-pair with the old one, with the only exceptions of Btrfs sub-volumes (that shouldn’t be a big challenge) and s/390 storage (that is still not properly managed by the underlying libstorage-ng). The bright part is that the new code is written with re-usability in mind, which means implementing an encrypted partition-based proposal (with no LVM) would be trivial. The new code is 100% covered by automatic unit tests and scores to the top in all the automatic quality checkers we have run (like Rubycritics, CodeClimate, and Rubocop). So now we are prepared for whatever the future brings, having lost no single feature in the way. The next challenge is to make the power of that new storage proposal available to the users through the user interface. In the previous post we presented the document describing the general ideas we wanted to discuss with UX experts. It’s our pleasure to announce we met the experts and we very easily reached an agreement on how the user interaction should be. During this sprint we already implemented a prototype of the future proposal settings wizard that is, as usual, included in our testing ISO. Now that we have solid foundations, it’s very likely that the following sprint will result in the fully working wizard, with almost-final wording and design. While fixing a problem with AutoYaST and CaaSP, we decided to extend our AutoYaST integration testing tool to support CaaSP. But, as a side effect, we also made some additional improvements that were long overdue (like improving the procedure to download ISOs, reducing timeouts, etc.). Now, our internal Jenkins instance takes care of running AutoYaST integration tests for the development version of CaaSP (as it already does for SLE 12 SP2). 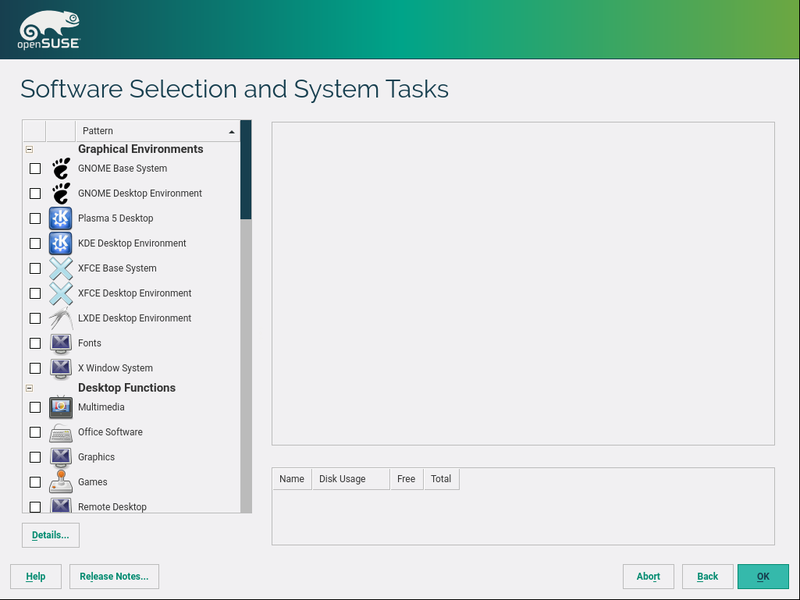 AutoYaST allows to define a set of services to be enabled/disabled in the installed system, applying this configuration during the 2nd stage (after the first reboot). Unfortunately, this approach won’t work for CaaSP because, in that case, the 2nd stage won’t be available. For that reason, during this sprint, we have adapted AutoYaST to write services configuration during 1st stage. As usual, not only CaaSP, but other future (open)SUSE versions will benefit of this change. Sometimes a very small simple change in a program makes a very noticeable impact in its everyday use. That’s the case of a fix implemented during this sprint. YaST usually re-tries to download the distribution release notes several times if the first attempt was unsuccessful. Although that’s correct from a general point of view, there are cases in which retrying makes no sense and only delays the installation. We have now added failed DNS resolution to that list of cases, which should result in a noticeable faster installation in many scenarios. Moreover, in the case of AutoYaST we now skip downloading the release notes completely. Downloading them don’t make us much sense in the kind of unattended scenarios handled by AutoYaST and skipping this step and all the possible associated problems result in a more robust process. In the previous sprint we switched to Docker at Travis so we could build and test our packages in the native openSUSE system instead of the default Ubuntu. This sprint we did the same change also for the Libyui library which implements the UI part of YaST. Originally we could not build the Libyui packages at Travis as either the required build dependencies were missing or were present at a very old unusable version. With this switch we can easily use the latest packages from openSUSE Tumbleweed and thus enable Travis builds for all Libyui packages. See you after Hack Week! And remember Hack Week is not a SUSE internal initiative, we are open to collaboration from anybody within or outside the company. So jump in and have fun with us! On November 16th there was the release of openSUSE Leap 42.2. On November 24th, I had the opportunity to present openSUSE Project at school. I was asked to make an introduction to FLOSS in general and more specific about openSUSE Project. The school was for middle aged people, for persons who quited school to work and conftibute financially to their families. There were 3 classes that they taught something computer related. It was a great opportunity for them to learn what FLOSS is and what makes openSUSE great Linux distro. There’s no warranties the drivers will work, for you! If you are satisfied with the open-source radeon drivers, don’t risk to break your computer ! Still there will NEVER be a fglrx driver for recent kernel and xorg. So if one of those component change in Leap fglrx will be broken. Since last december, AMD doesn’t published any update about fglrx so the version is still the 15.12.302 published. A few days ago our beloved Leap release manager Ludwig ask me by email, if there will be an available drivers for Leap 42.2. Today, after hacking a bit the last Sebastian Siebert’s script I’ve been able to build the drivers for Leap 42.2 RC1, and the driver install fine, and xorg start on my HD5750 (but that’s all what I can tell). I will rebuild the driver once Leap 42.2 will hit its final stage. AMD has stopped any development for FGLRX, so it is already considered obsolete. But on the other side they make a lot of effort to bring radeon and amdgpu (the free and open source driver) to a decent performance level. I don’t have that much usage anymore of my AMD gpu powered computer, and my HD5750 is now 8 years old already, so I can’t promise to be able to follow up with changes. I removed all the obsoletes packages letting only the last one for each openSUSE version still available. Also the server has no more copy of openSUSE github artwork. If this missing to someone, don’t hesitate to ask.